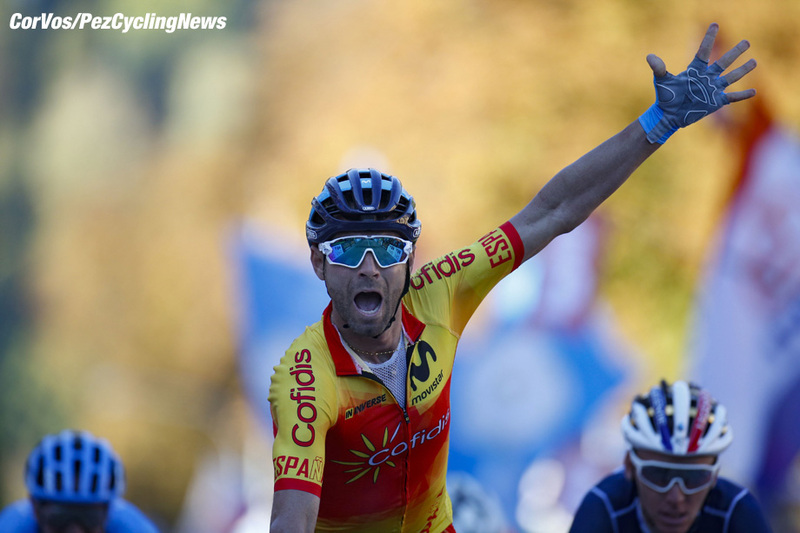 PezCycling News - What's Cool In Road Cycling : WORLDS’18 MEN’S RR: Valverde’s Pot Of Gold! WORLDS’18 MEN’S RR: Valverde’s Pot Of Gold! 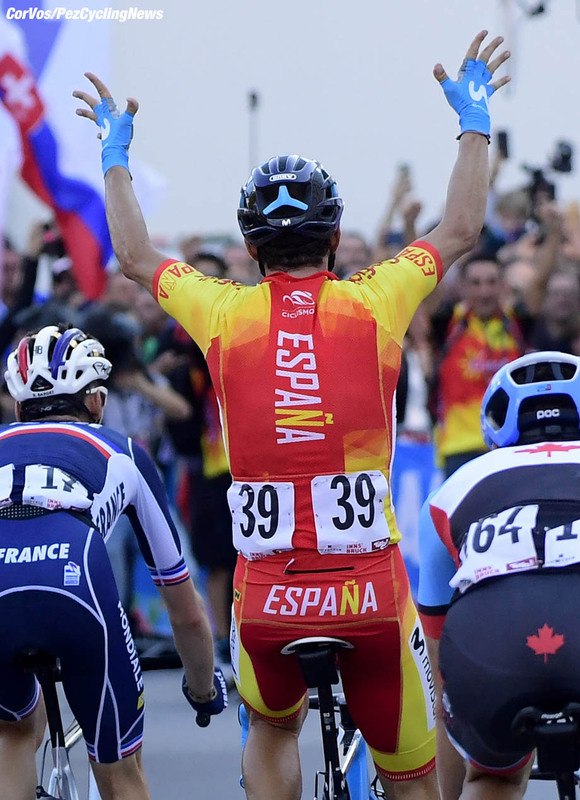 Men's Elite Road Race: Alejandro Valverde finally claimed his first World Championships at 38 years of age after a fantastic race in Austria which turned into one of the best day's of racing of the whole year. 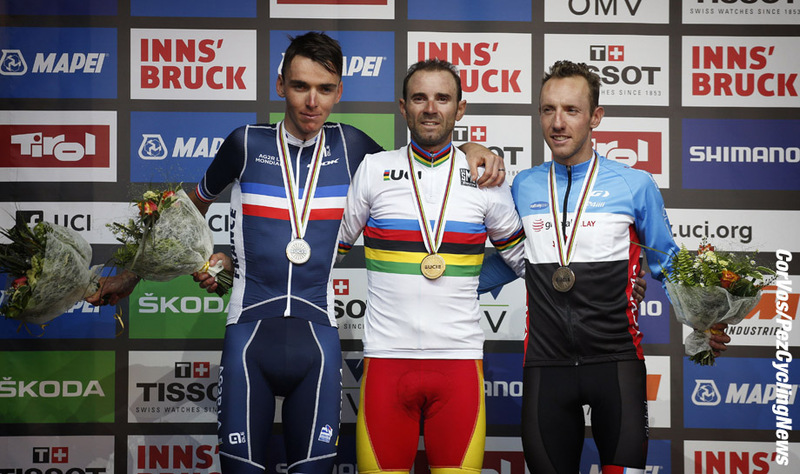 Canada's Michael Woods set the finalé on fire with Romain Bardet (France), but it was the man from Spain who swooped to the victory in Innsbruck. This race was always going to be selective but the final climb completely blew this race apart. A break of eleven went clear and built a lead of almost twenty minutes, it was always going to come back but it came back far later than expected. The real heroes of the day were Vegard Stake Laengen and Kasper Asgreen were the last men left standing and they made it onto the final ascent of the Iglis climb with still more than a minute of a lead. The Italian team were trying to spoil the party though and their pace making but an end to a break which, at times, looked like it might actually stay clear to the finish. When they were caught it was Michael Valgren who pushed on over the summit as he responded to an attack from Britain's best rider on the day, Peter Kennaugh. The Dane built a lead of 30 seconds and led onto the final climb but he was caught as the gradient ramped up continuously. The final climb really was hell, Romain Bardet led the way and he blew apart the field as only Michael Woods, Gianni Moscon and Alejandro Valverde could follow. 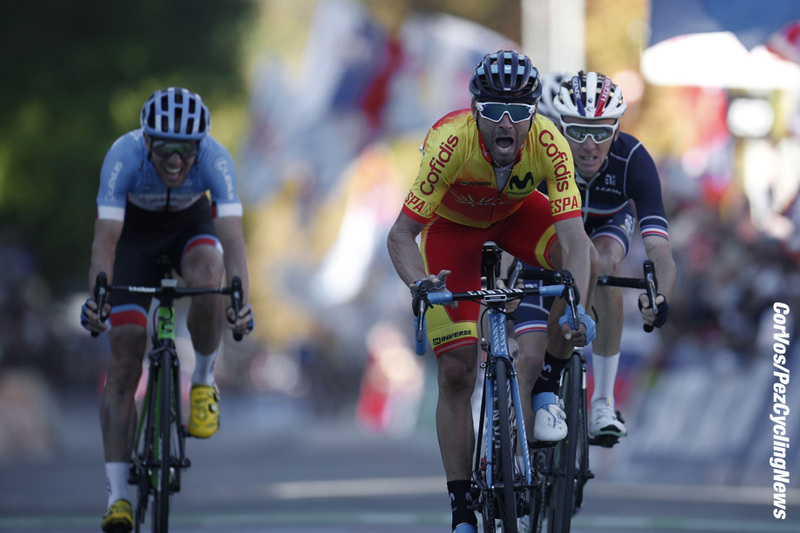 Michael Woods was the surprise of the day and his acceleration removed Moscon from the group. 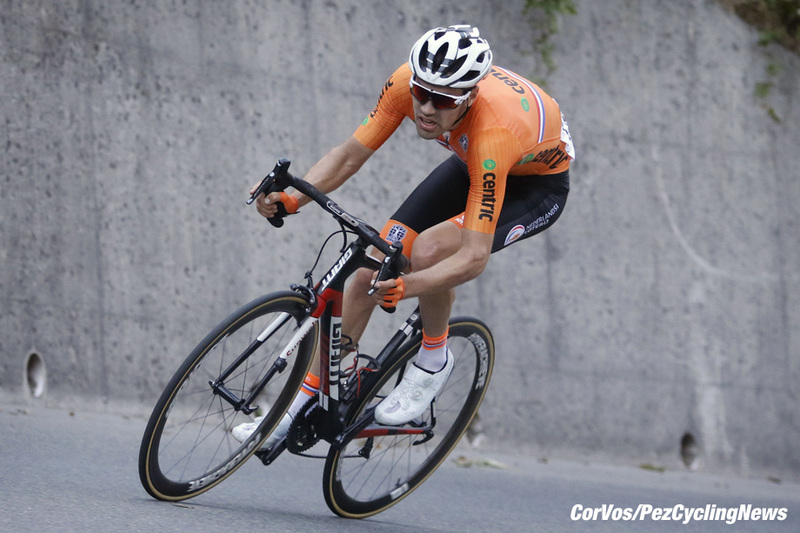 One of the iconic moments of the race was Tom Dumoulin zig-zagging his way up the steepest gradients but it was the quickest way up and he closed the gap to the leading trio in the second half of the climb. He didn't make the junction at the summit but he descended like a rock and make the leading trio a quartet with less than 3km to go. Valverde was the best sprinter of the four and he was forced to the front but his sprint was just too good for Bardet or Woods. Dumoulin had used all his energy getting in contention and he had to settle for fourth. 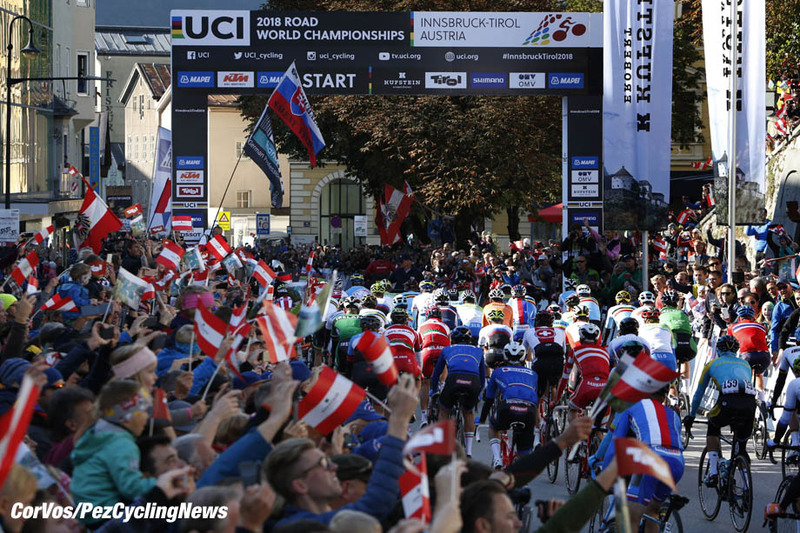 The last World Championships was on a course which resulted in a hard man's sprint, the one before was in the pan flat environs of the Qatari desert, the race for the rainbow jersey has veered wildly away from recent years as we face one of the toughest courses of all time around Innsbruck. The race starts in Kufstein, around 90km and one small climb to the north east of Innsbruck, once we are in Innsbruck the course gets really simple, laps of the 6.7km, 5.8% Iglis climb. The stats might not be too impressive for one ascent but the peloton will be facing this seven times and there are only 16kms of recovery from the top of the Iglis to the next ascent. 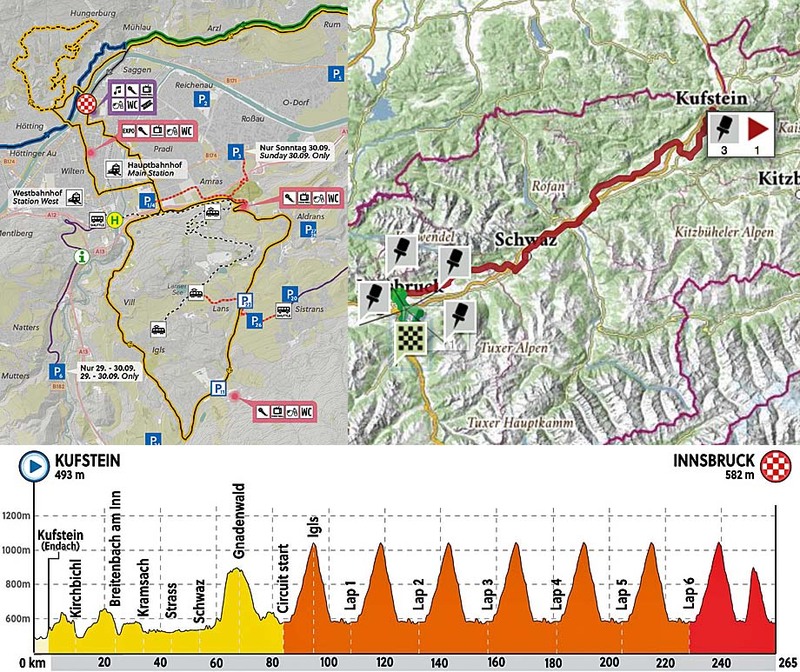 After seven ascents and 252km there's a sting in the tail in the form of the Gramartboden, 2.5km @ 11.7%. With a climb of this difficulty coming just 8km from the finish it's tempting to think that the race will wait to explode on here, the course is just too difficult though, this will be the icing on the cake not the whole cake. One of the best bits about the early portion of the World Championships is seeing a group of relative unknowns gain huge chunks of time on the rest of the peloton, and today was no different. Within a few minutes of racing, a break had gone, featuring: Robert Britton (Canada), Tobias Ludvigsson (Sweden), Kasper Asgreen (Denmark), Ryan Mullen and Conor Dunne (Ireland), Daniil Fominykh (Kazakhstan), Vegard Stake Laengen (Norway), Karel Hnik (Czech Republic), Jacques Janse van Rensburg (South Africa), Ilia Koshevoy (Belarus), and Laurent Didier (Luxembourg). They had gained almost twenty minutes before the race even hit the finishing circuit. The break were working well but at some point the peloton would wake up and with 150km to ride they did. First Ian Stannard (Great Britain) was dispatched to the front and he was joined by Anthony Roux (France) as they started to take a hold of the race for Simon Yates and Julian Alaphilippe respectively. The peloton weren't given to handing back all the time as quickly as they gained it though and with 130km to go the gap was just over 15 minutes. Laurent Didier was the first man to lose contact with the formerly 11 man leading group and he drifted back towards the peloton, a gap of around 12 minutes with still a little over 100km to go. Mullen and Dunne were the next riders to depart from the break and Peter Sagan (Slovakia) was also sent out the back, it wasn't to be another rainbow jersey. 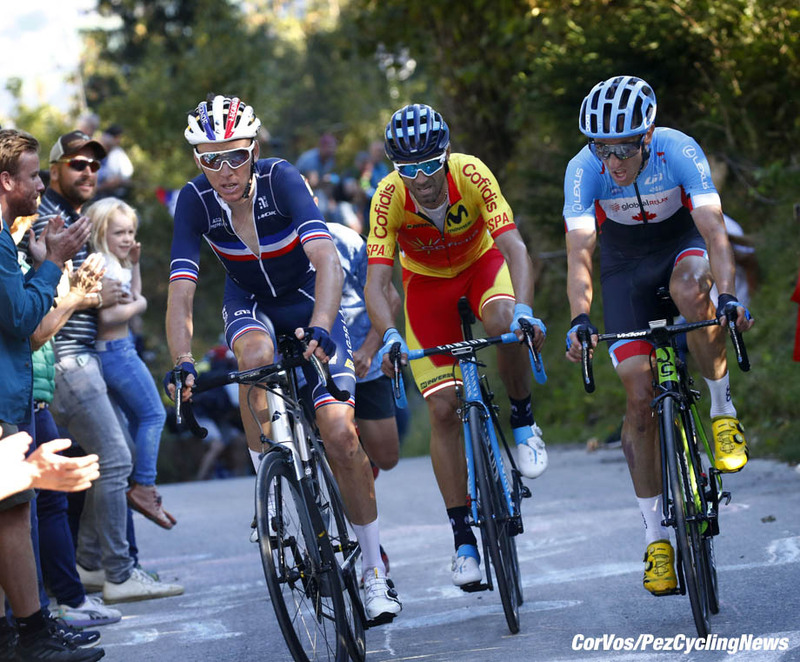 Warren Barguil (France) had been suffering on each ascent but and his misery was compounded by a crash as he followed the French team car back into the race. With 80km to ride the gap was seven minutes, the break were undoubtedly fading but they still had plenty of time longer into this race than probably anyone would have anticipated. Great Britain and Spain were doing most of the pace making as Italy and Belgium were completely hidden, saving their resources for later. With 69km to ride the pace was rising but the gap was still over six minutes, the break were hurting though and riders were being shelled out constantly. Ludvigsson and Koshevoy were the next to go leaving just Britton, Asgreen, Stake Laengen, and Janse van Rensburg alone in front. With 60km to go there were two ascents of Iglis to go and one ascent of the brutal climb of Gramartboden. 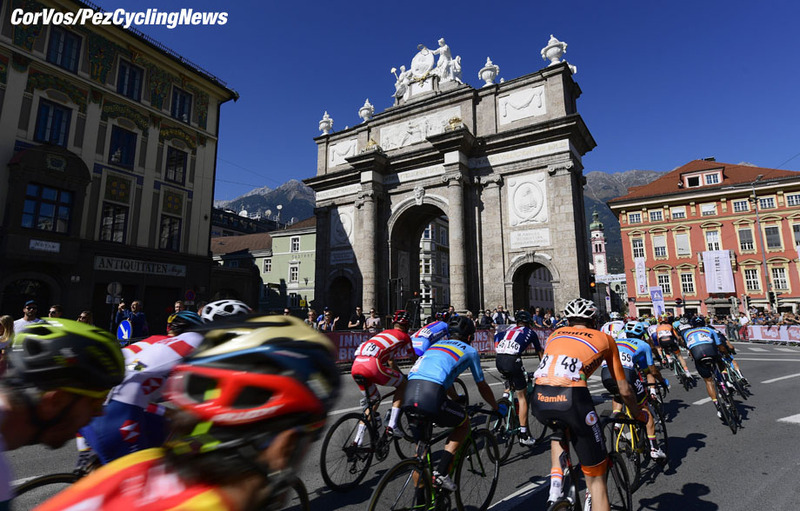 As we approached the penultimate ascent of Iglis there was an attack from Greg van Avermaet (Belgium) who was followed by Damiano Caruso (Italy) and Omar Fraile (Spain) they were pushing on but the peloton were keeping relatively close tabs on them, keeping them under 30 seconds. The break were on Iglis and it was victory for Scandinavia over the Commonwealth as Britton and Janse van Rensburg went pop in quick succession leaving Asgreen and Stake Laengen the lone leaders with 50km to go. 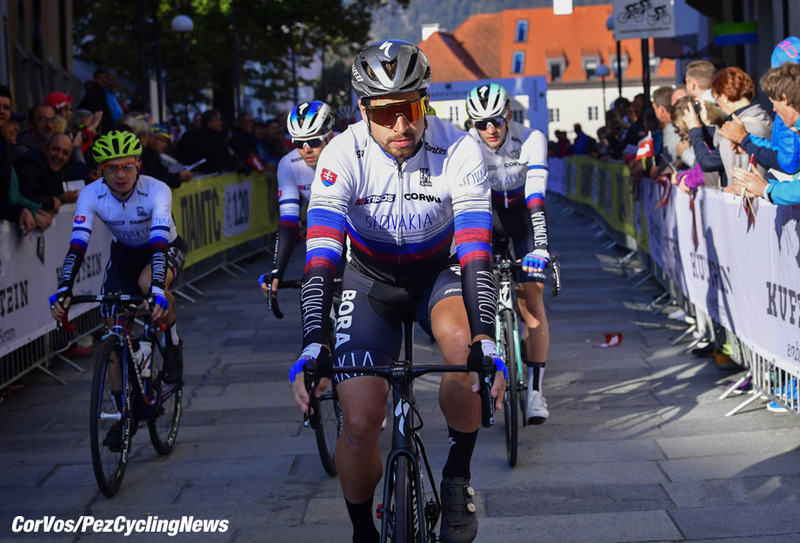 Meanwhile, Primoz Roglic (Slovenia) had been distanced after a crash on the previous lap and it looked like his race was over but the Slovenian team had emptied their resources to bring Roglic back into the pack, a pack that was now heavily reduced. 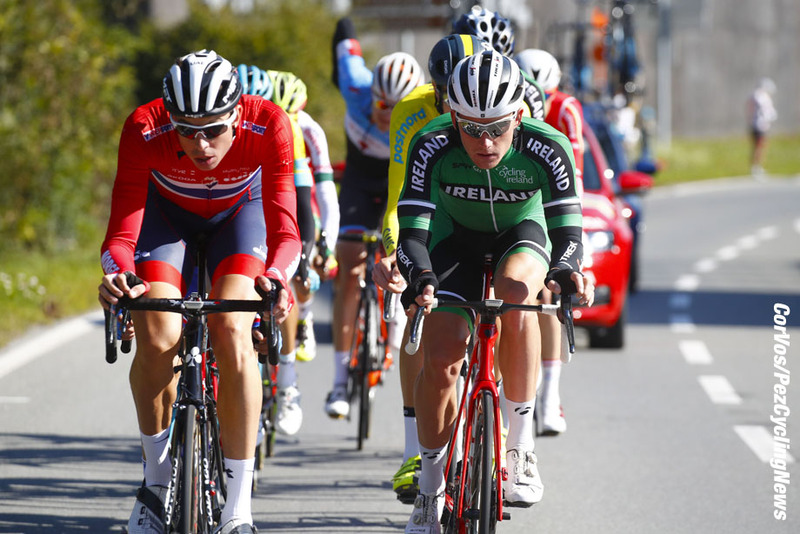 Great Britain were down another worker as Tao Geoghegan Hart fell away on the climb, his work had reduced the peloton and the gap but as he fell back there were just three Brits left in the mix; the two Yates' and Hugh Carthy. The two Scandinavians were working well together but the gap was collapsing, it was 3.18 with 47km still left to ride. This penultimate climb of the Iglis was proving to be a launchpad for multiple attacks and the Van Avermaet group were being brought back as the attacks just kept coming. Simon Geschke (Germany) was the first across the gap but he was joined by the rest of the peloton almost immediately. The pace was hurting the legs and Dan Martin (Ireland) and Bob Jungels (Luxembourg) were both sent out the back. Sam Oomen (Netherlands) was now doing the pace making as it slowed down considerably after the near countless attacks on the slopes of the climb. Simon Yates (Great Britain) and Wout Poels (Netherlands) were also out the back, this race was so brutal. Italy had been virtually invisible but now they were hogging the front of the bunch as we neared the top of the climb. Michal Kwiatkowski (Poland) was the next to go from the lead group. Gianluca Brambilla (Italy) was forging on at the front of the peloton and he was joined by David de la Cruz (Spain) and Antwan Tolhoek (Netherlands), the lead wasn't substantial though and the gap to the leading trio was still almost three minutes. 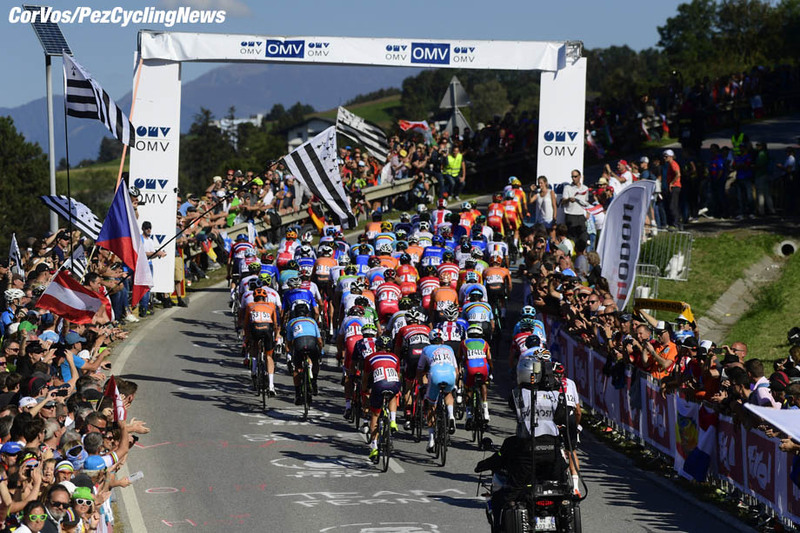 The trio were being chased by another trio of Emmanuel Buchmann (Germany), George Bennett (New Zealand) and Rudy Molard (France) and they were caught as the crowds got deeper near the top of the climb. 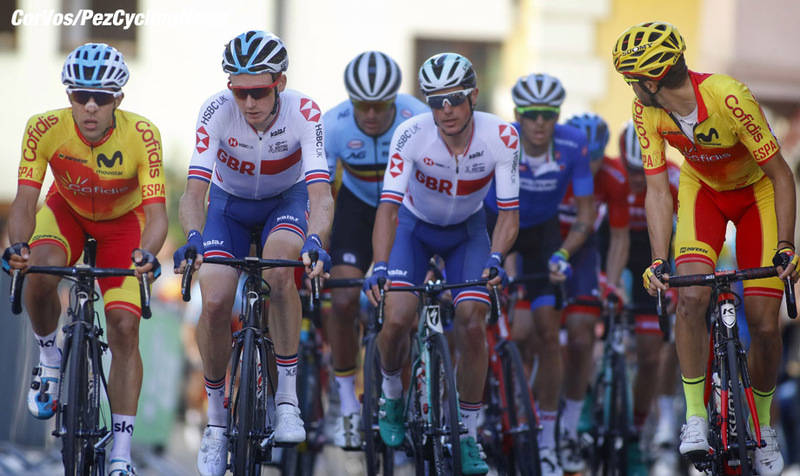 There was another counter attack as Peter Kennaugh (Great Britain) and Jack Haig (Australia) made it across but the peloton were almost immediately with them and as the main group hit the top of the climb it was all back together, albeit with a significantly smaller chasing group. This was a race that could still be won by upwards of 40 riders, significantly fewer than we had seen in recent years but probably more than might have been imaged, specifically when you see how many contenders had been dispatched from the back. The two leaders still had 2:44 with 35km to go, surely they weren't going to win but what a sensational ride this was. The peloton had been attacking amongst themselves and there weren't many domestiques left in the peloton. The remaining British trio of Carthy, Kennaugh, and Adam Yates were still in the peloton but they were sat right at the back of the peloton. This was it, the final lap, and against all expectations there was still a break leading. 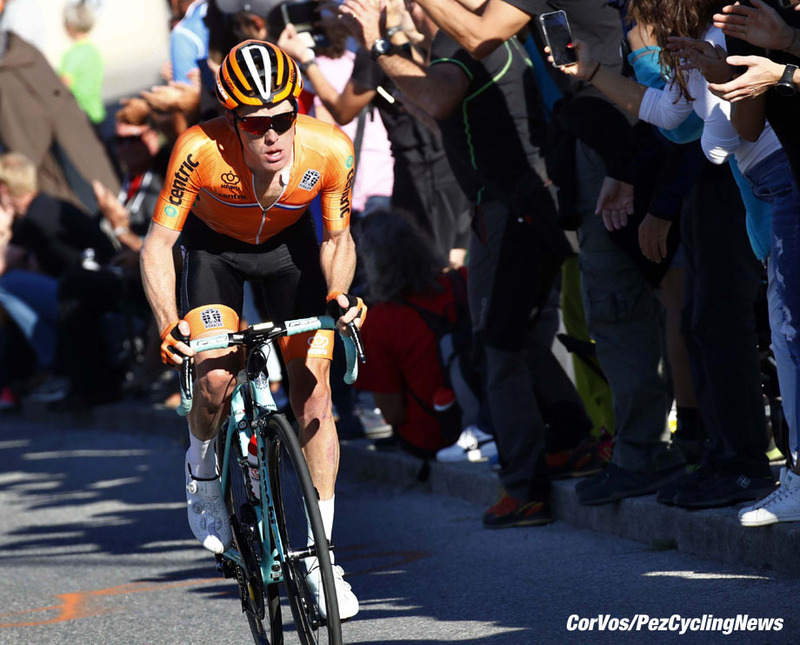 Asgreen and Stake Laengen were holding their own on the flat but they were losing time on the climbs and there was one more ascent of Iglis and the final brutal ascent of Gramartboden. 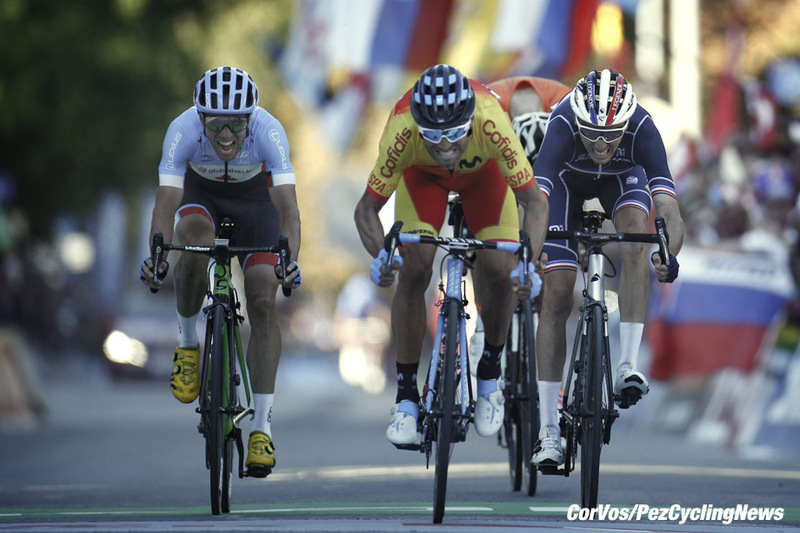 France and Italy were sharing the pace making on the front of the peloton, they still had numbers in their teams but apart from Spain there weren't any other teams who were in a position to really contribute this far into the race. The leading duo hit the Iglis for the final climb, the gap was 2:15 with a gap of that size it was going to be hard to see the duo caught before the summit. There was still the firepower in the peloton to ignite multiple attacks. Italy were lined out in one long line and the gap was closing, it was just 1.45 now. The Italian resources were depleting though, Brambilla and Caruso were out the back and Franco Pellizotti was now leading the way. The duo's lead was collapsing, it was 1:24 with 26km left to go, their efforts were heroic but Italy had kept their powder dry until this deep in the race and were now unleashing hell. 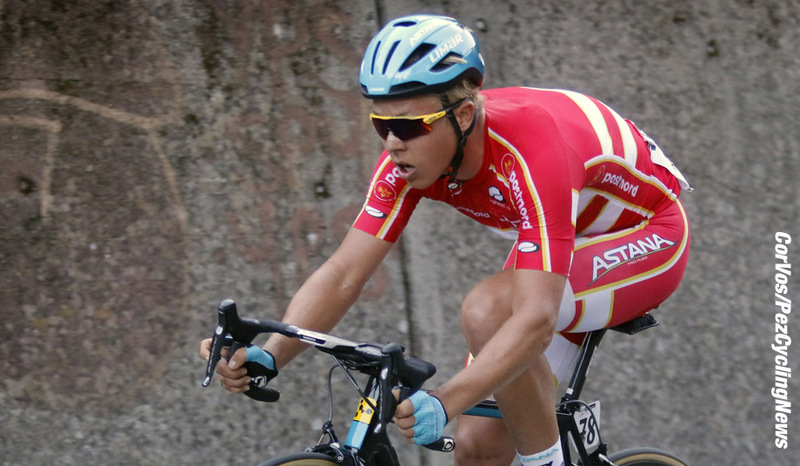 Tim Wellens (Belgium) was gone from the peloton as was Dario Cataldo (Italy) who had done some work earlier. Italy had five riders and they were being shadowed by the Dutch team who were cranking it up. The lead was now 1:07 and there was a chance that they would be caught before the top of the climb. The attacks were now going, Steven Kruijswijk (Netherlands) was on the front and he was being matched by Greg Van Avermaet (Belgium) who was somehow still in contact. The duo were going to be caught before the summit, the attack of Kruijswijk had sliced 30 seconds from the lead and they were now in view. Alejandro Valverde (Spain) was also near the front and primed for a possible attack as Kruijswijk continued cranking it up. Vincenzo Nibali (Italy) was going the other way though, despite all the Italian pace making he was falling out the back and out of contention. The main group was now down to around 30-40 riders, a small group yes but still significantly more than we thought. Italy were back on the front with 3km left to ride on the climb. Sam Oomen was the next to go from the Netherlands who were the team really trying to break the race apart. The peloton were back to the leading duo, 230km after they let them go, what a sensational ride. As the catch happened Van Avermaet was out the back, he'd done well to get this far into the race but this was it. Oomen was again driving the pace and he was beginning to force a split but he wasn't getting any assistance and it was coming back together. 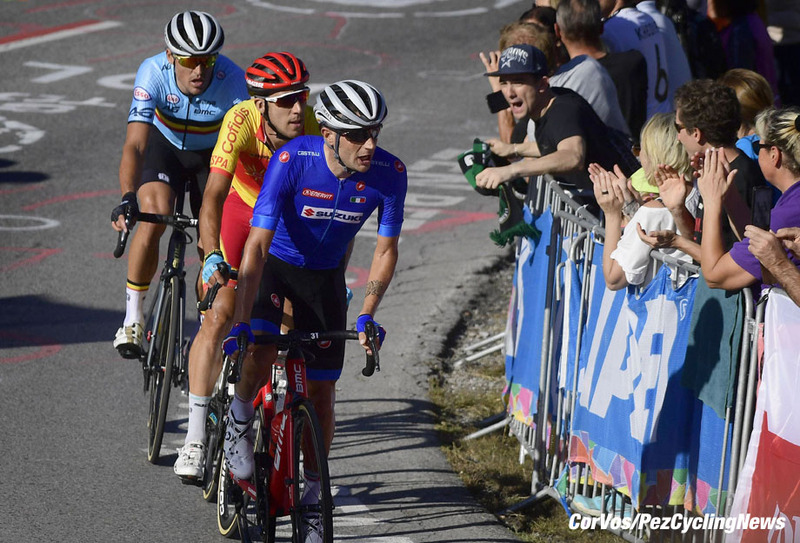 Thibaut Pinot (France) was covering everything and he was now in third wheel but Pete Kennaugh was attacking around the outside and there was no immediate response. Kennaugh was meant to be a support rider but his leaders had disappeared and he was the last man standing. 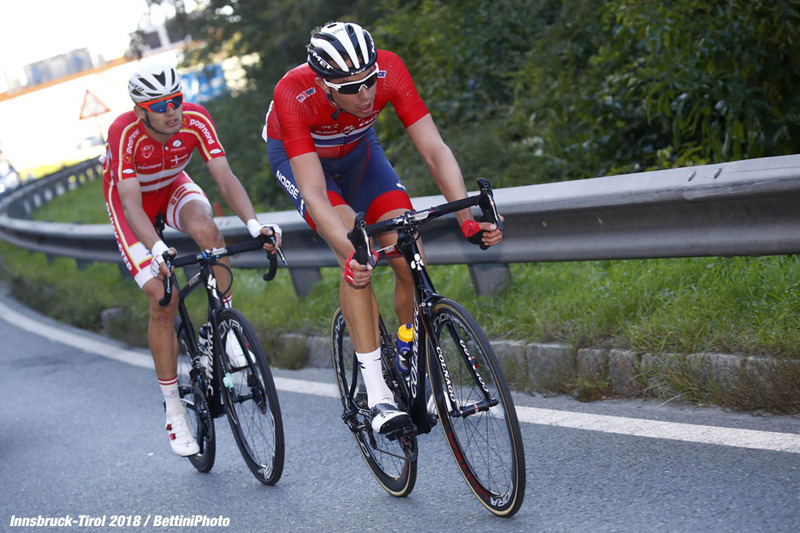 His gap was growing and he was now getting some assistance in the form of Michael Valgren (Denmark), the duo were building a lead but Kennaugh was struggling to stay with the Dane and Pinot was in a closing third place. Gianni Moscon (Italy) was continuing to look comfortable and he was working across the gap to the chasing group. Valgren was looking fantastic and he was forging clear of the chasers, none of whom really wanted to commit. There was a chasing group of six, of which Kennaugh was one, and the peloton were barely ten seconds behind them. Valgren's attack had come at the perfect time, there was almost no domestiques left behind and the peloton was in pieces. Rui Costa (Portugal) had been invisible in the race but he counter attacked on the descent and Kennaugh tried to go across but he was brought back by the remaining chasers. 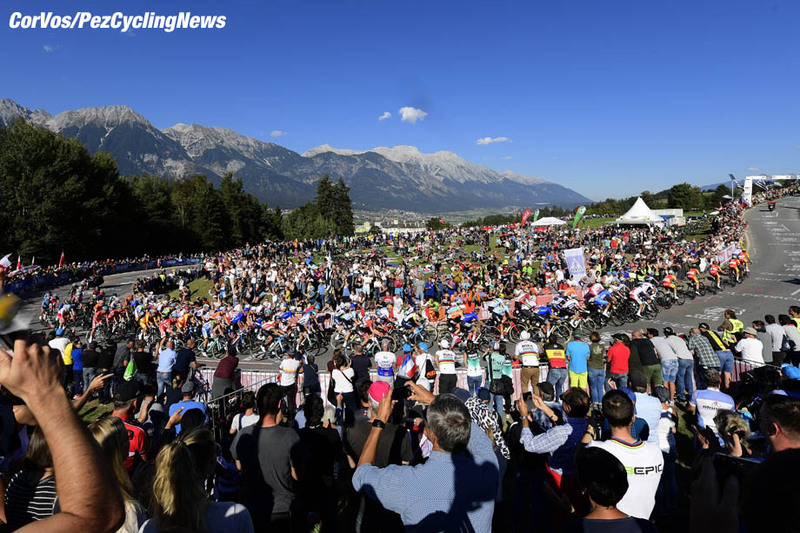 Costa's lead was just seconds from the group of Pinot, Kennaugh, Moscon, and Ion Izaguirre (Spain) but they were now collecting by the descending peloton and it was 25 riders in the group versus Valgren. It was all going to come down to the final ascent and Valgren was fully committed. We were on the climb, Valgren was leading by 34 seconds but the French were lined up behind and the race was in bits. Valgren's gap was falling and there were only seven riders in contention behind and three of them were French. The gap was just 16 seconds now, the French team were hauling Valgren back but they were taking Alejandro Valverde (Spain), Moscon and Michael Woods (Canada) with them. Valgren was caught and Romain Bardet (France) was now leading the way and, if anything, he was putting Alaphillipe in trouble. Bardet had dropped the team leader and Michael Woods was now pushing for home. This was epic racing, Bardet was second wheel and Valverde was third and Moscon was beginning to lose contact. Moscon was back and there were four riders leading with Tom Dumoulin (Netherlands) trying to close the gap and swerve madly as he tried to make the climb as flat as possible. Valgren wasn't done yet, he was with Alaphillippe around 25 seconds further back. Woods was pushing on again and again Moscon was almost eating his stem. Woods was pulling Bardet and Valverde clear and Moscon was gone. Dumoulin was almost at a standstill but that was quick enough to remain in contention and maybe he was even closing. Bardet was in second wheel with Valverde in third and now Bardet was leading the way. Valverde hadn't hit the front all climb, he was content to watch but now he was on the front as the climb flattened. Bardet attacked now and Valverde responded and Woods was easily on the back. Moscon and Dumoulin were closing the gap though and they were together. If the trio of Valverde, Bardet and Woods didn't ride then they were going to come back into the clutches of Tom Dumoulin who was now just 13 seconds back. The Dutchman had looked out of it at the start of the climb but he'd measured his effort and was now fighting back. Dumoulin was in sight, and the descent was about to begin. Moscon was next to come past but he was too far behind. Bardet was leading the descent and he was trying to pressure the two riders behind him, both Woods and Valverde were hanging in there though despite Bardet's superior descending ability. Woods was slightly hanging off the back as Valverde now set the pace on the descent. Valverde forced Bardet to the front and Woods was now in second place, there wasn't much left of the descent and so the leading trio were going to hit the final 3km together. We'd heard that Dumoulin may have had a mechanical but no, he was almost back with them. The gap was less than ten seconds and the trio didn't know he was there. Dumoulin was motoring but he only had 2.7km left to ride. The gap was now seven seconds and Dumoulin was trying to adjust his rear brake. He'd got within five seconds with 2km left to go and he was going to make the catch. It was going to be four riders at the finish. Dumoulin made the catch. Valverde was leading the way, he was the strongest sprinter but he was being made to do all the work but now Woods was on the front after a small attack. Dumoulin was sat on the back as they hit the final kilometre. Dumoulin hit out but stopped as he was spotted. Valverde was leading the way with Woods in second and Bardet third. Woods was watching Valverde's back wheel and Moscon couldn't be too far back as they messed around. Valverde was going to lead it out and Woods was in second. Bardet was third as they started the sprint. Valverde went from a way out and Bardet was closing but no, Valverde held them all off. Dumoulin had emptied the tank making the catch and he had nothing left. Woods had broken the race up on the climb but he would've loved it to finish at the summit and not 8km after. Bardet finished in second but as soon as Valverde opened up the sprint, there wasn't anyone who could pass him. What a race though, the race had been whittled down and whittled down until the final climb when it had completely blown apart. Tom Dumoulin's chase had added drama to the finale but ultimately Valverde had timed it perfectly. A first World Championships for the 38 year old, chapeau. 25. Sergei Chernetski (Russian Federation) at 2:00.